This post is about the planet Jupiter and the spacecraft Juno, launched in August 2011 and orbiting Jupiter since July 2016. The image shows both the planet and the spacecraft. He lusted for Io, and transformed the girl into a cow, to hide her from his wife. In vain, Juno asked him to give her the cow as a present. He fell in love with the nymph Callisto and took the shape of virgin goddess(!) Artemis to seduce her. He was so enchanted of Ganymede, that, in the shape of a raven, he took the beautiful boy(!) to Mount Olympos. Back to astronomy. Jupiter is the largest planet in our solar system. The planet is so big that all the other planets would fit in it. It is the second-brightest planet (after Venus) in the night sky. 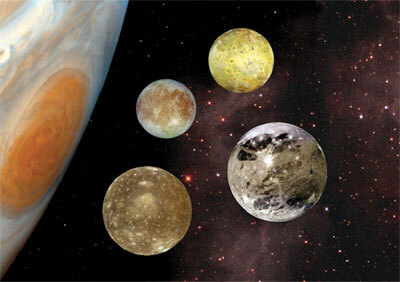 In 1610, Galileo discovered that Jupiter has four moons. In the image you can see their size, compared to Jupiter. They look small beside the planet, but they are actually big. The largest one, Ganymede, is bigger than the planet Mercury! The four moons were named after the four lovers of Jupiter named above! Below you see a (resized) image of each moon and a painting with Jupiter in action. Callisto seduced by Jupiter disguised as Artemis. 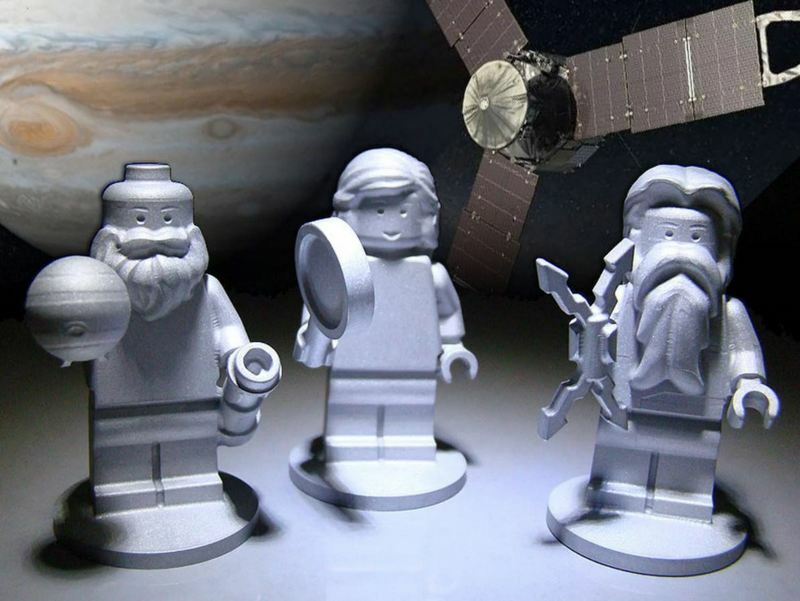 Actually the mission of Juno is to explore Jupiter and not his moons…:-) Much is still unknown about this gas giant. Does it have a solid core? Does its atmosphere contain water? An important part of the mission will be the study of Jupiter’s gravitational and magnetic fields. To give the spacecraft enough speed at launch to reach Jupiter would cost too much energy. Therefore it is first launched in an (elliptical) orbit around the sun. The Deep Space Maneuvers one year later will bring it back very close to Earth, which will give it a gravitational slingshot. See my Rosetta blog for an explanation. As a result the orbit becomes a hyperbole, at the right moment crossing the orbit of Jupiter, where it will be captured by the planet. Here is a fascinating animation of the whole process. 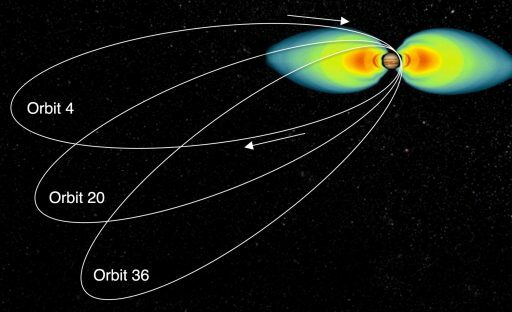 Jupiter has to be approached carefully because of its intense radiation belts. The magnetic field of a planet traps charged particles like electrons and protons in a doughnut-shaped region around the planet. Earth has these radiation belts, they are called the Van Allen Belts. 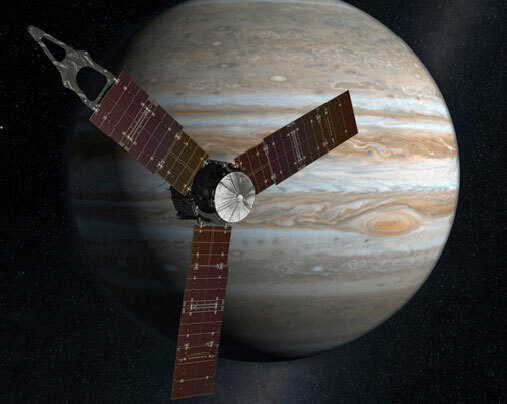 For Jupiter they are many thousand times stronger and can seriously damage the spacecraft. To protect the instruments of Juno, the most sensitive ones have been placed in a titanium container with 1 cm thick walls and a weight of 18 kg. 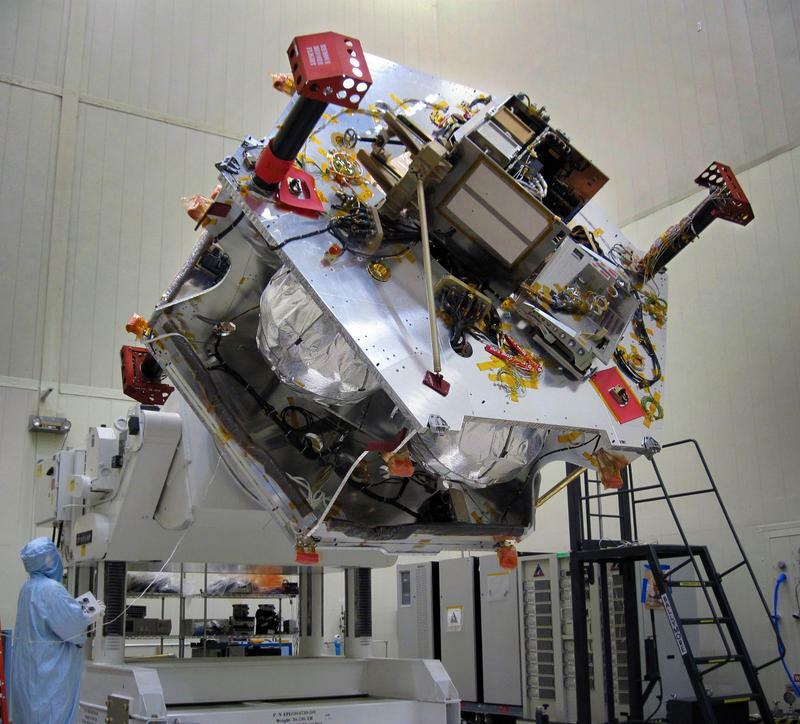 Here is an image of the spacecraft during assembly. The Radiation Vault is the brown box on top of the spacecraft. Note the size of the human! The capture orbit is very elliptical with a period of ~ 54 days. The original plan was to reduce the period to 14 days, after two capture orbits (1 and 2). The first reduced orbit (3) would be a clean-up orbit, followed by 32 “science” orbits (4-36), each of them slightly shifted, so the whole surface of Jupiter would be covered.The image gives an impression of these science orbits. Mind you, during each 14 days only a few hours before and after perijove (the point of shortest distance to Jupiter) can be used for science! 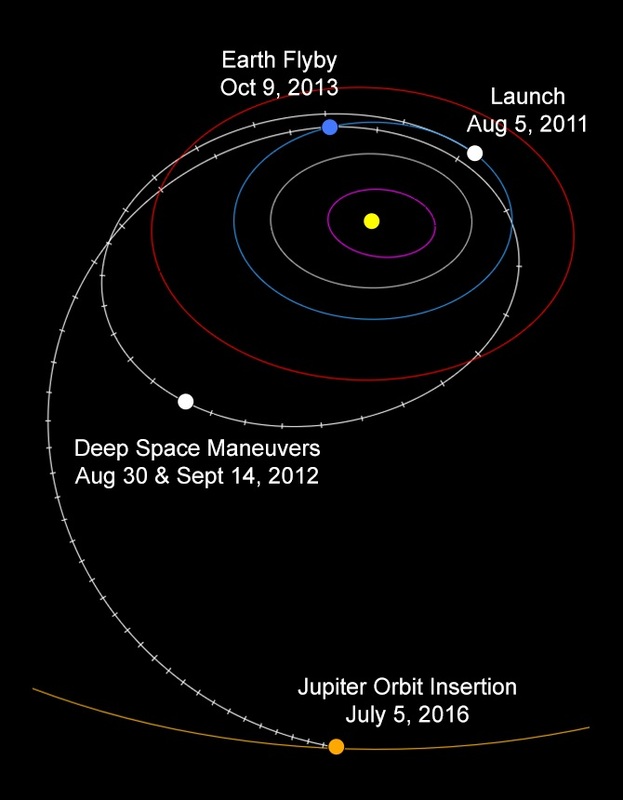 However, during the second orbit, a few days before the planned Orbit Reduction Maneuver on 19 October 2016, a problem was found with some helium valves needed to operate the main engine, and a few hours before perijove, the spacecraft went into “safe mode”, because the onboard computer encountered unexpected conditions. The next two orbits were used for testing and diagnostics. Finally, on 17 February 2017, mission control decided it was too risky to perform the Orbit Reduction Maneuver. So the spacecraft will remain in its 54 day orbit. Totally 12 science orbits will be performed until July 2018. The next perijove (orbit 7) will occur on 11 July. It must have been quite a disappointment for the scientists, instead of new data every two weeks, they now have to wait almost eight weeks. Are there results already? The instruments that are measuring the magnetic field of Jupiter and the composition of the Jovian atmosphere are collecting data, it seems the magnetic field is more lumpy than expected. 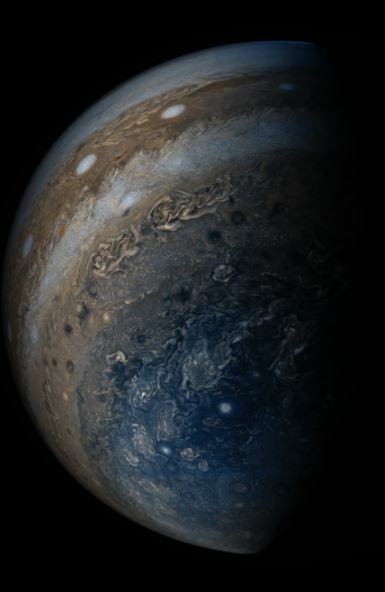 The most spectacular results come from the on-board camera Junocam. 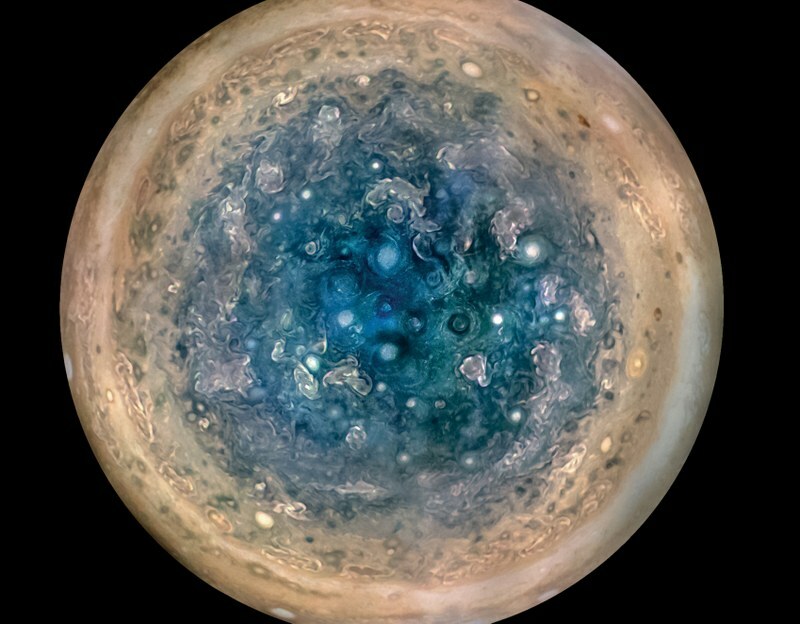 Here is an image of Jupiter’s south pole, not observable from Earth. Amazingly complex and turbulent. And last week NASA published another picture, taken 19 May, just after Juno passed perijove 7. Keep in mind that these images are color enhanced! Part of the south pole region is visible. The white spots are part of the “String of Pearls”, massive counterclockwise rotating storms. The next orbit will pass over the famous Great Red Spot, a storm on Jupiter that has lasted already for several hundred years and is so big that Earth would fit inside it. Will be interesting to see images. At the end of the Juno mission, the spacecraft will be directed into the Jovian atmosphere, where it will be completely destroyed. This will be done to avoid any chance that material of Juno might “contaminate” one of Jupiter’s moons. If ever life forms are found on these moons, there must not be any doubt about its origin. Preparing this post, I have made extensive use of a very informative web page: Juno Mission and Trajectory Design . Very detailed and sometimes quite technical, but worth reading. A chaconne is a musical dance form in triple metre, popular during the Baroque and consisting of a theme with variations. Just to name a few composers, Telemann, Pachelbel, Couperin, Vivaldi have written chaconnes (the links refer to YouTube). But when music lovers talk about The Chaconne. they mean the last movement of Bach’s Partita No. 2 in D minor for solo violin. Over the years I have heard Bach’s chaconne numerous times and still it affects me deeply. There has been a time that I thought it would be perfect music for my funeral, but later I decided that it might take too long.. :-). Of course you can find numerous versions on YouTube. Here is beautiful one, performed by talented violinist Hilary Hahn. She plays the chaconne quite slowly (almost 18 minutes), most performers play it faster, in about 14 minutes. For example Yehudi Menuhin in a recording from 1956. Not surprisingly, there are also plenty recordings where the chaconne is played on other instruments. An obvious choice is the guitar. In the opinion of some the chaconne sounds even better on a guitar. Personally I don’t agree, but I must admit that for example this performance by John Feely is brilliant and moving. Here are a few other recordings I found on YouTube. First four recordings on single instruments: flute, clarinet, organ, accordion, cello and marimba. In my opinion woodwinds are not suitable for this work. The marimba recording is actually quite nice. Organ and accordion are too massive for me. The cello recording is not bad, but I find the range of the violin more suitable. In 1930 the English conductor Leopold Stokowski wrote a transcription of the chaconne for symphony orchestra. More transcriptions exist, but this is probably the most famous one. Very romantic and dramatic, but emotionally it has no effect on me. Listen to this recording, put the volume on maximum and fasten your seat belts :-). The recording is from 1950 and conducted by Stokowski himself. You may have noticed that I have not mentioned the piano until now. That was on purpose. Of course there are many recordings for piano. Most pianists play the transcription of Ferrucio Busoni. He was an Italian composer, pianist, conductor, etc, who has transcribed many of Back’s work in a romantic way. More a recreation than a transcription, that’s why it is often called the Bach-Busoni Chaconne. Here is a brilliant recording by .Evgeny Kissin. You can follow the score. An impressive performance of Kissin, but still I think something is missing. There exists another transcription, created by Brahms. He wrote it for the left hand alone! A brilliant idea, listen to Daniil Trifonov. De gustibus non est disputandum (tastes differ), but for me this is the recording that comes close to the original in transparency and emotional power. The last week I have been listening to dozens of recordings of the chaconne, never boring. It remains for me one of the pinnacles of human culture. 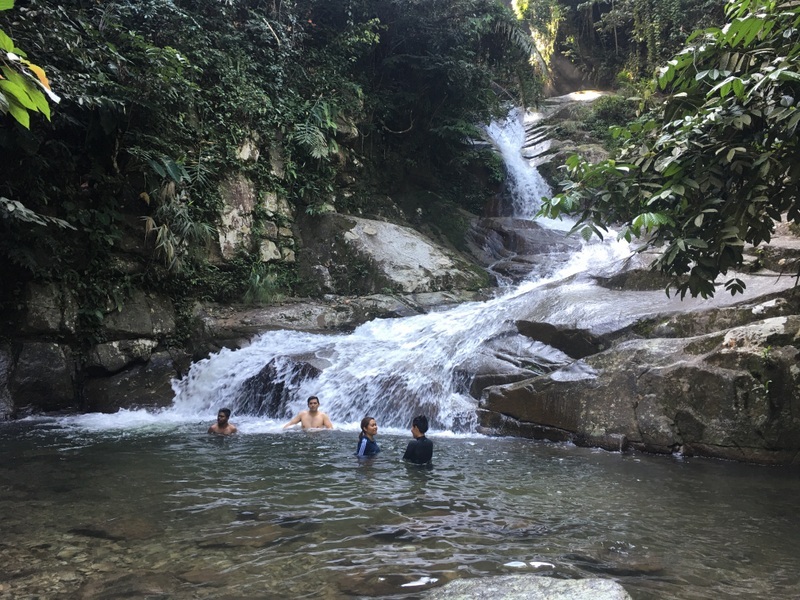 Recently I visited the Lepok waterfall in the Ulu Langat region with a group of friends. Checking my archive I found that this was my fifth visit! The first time was in June 2004, 13 years ago. 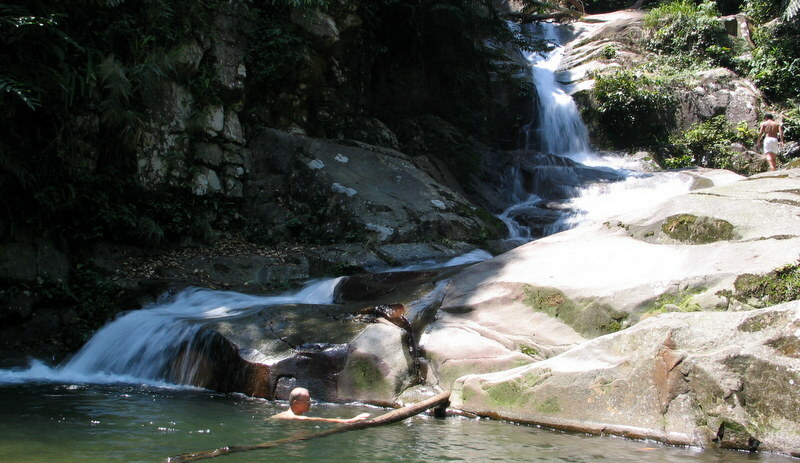 One year earlier I had met Khong, the webmaster of a website about Malaysian waterfalls. He had become more interested in bird watching and we agreed that I would take over his waterfall site. Of course I had to revisit many waterfalls and update the description and pictures. One of them was Lepok. 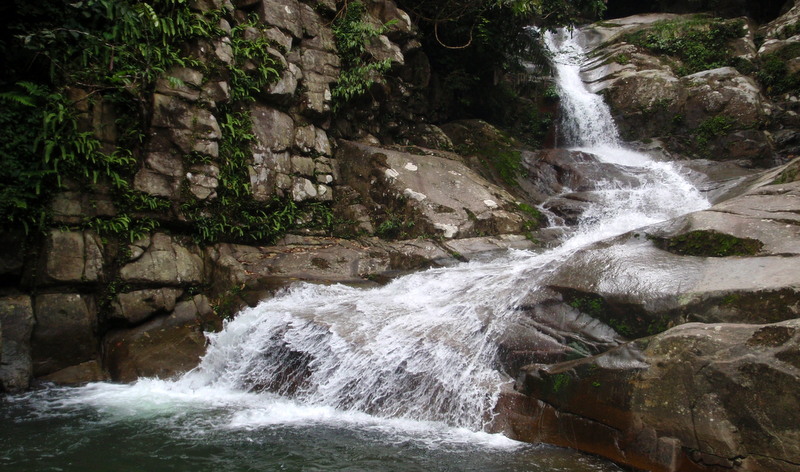 Have a look at Khong’s original Lepok Waterfall page. Here are some of the pictures I took during my first visit. 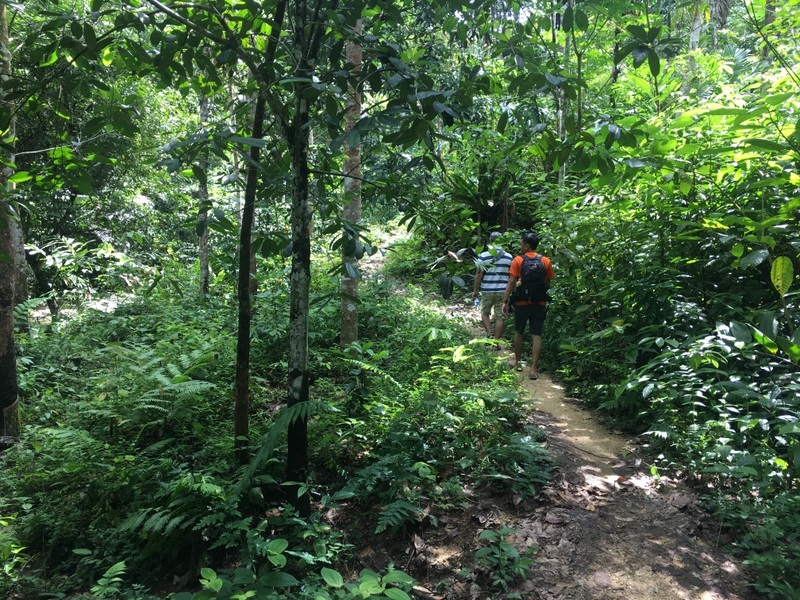 It was durian season, the orang asli told us we could eat what we found…:-) The waterfall was pristine, but not a lot of water. When you look at the updated Lepok Fall page you will see that there are many comments, a sign that the fall has become popular. The second time was in September 2008. This time there was a lot more water. 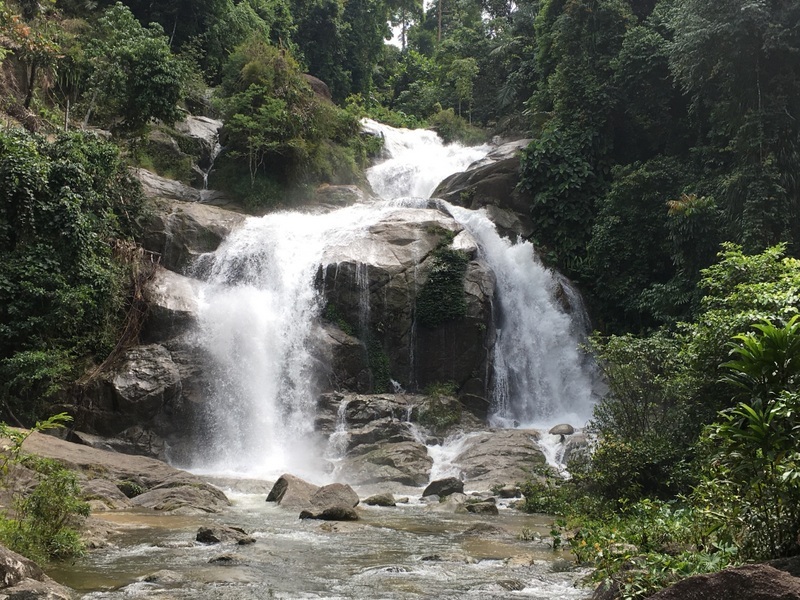 We discovered that there is a lower Lepok fall, a few hundred meter before the main fall. In a narrow gorge, not easy to access, but we have seen people abseiling there. My next visit was in January 2013. 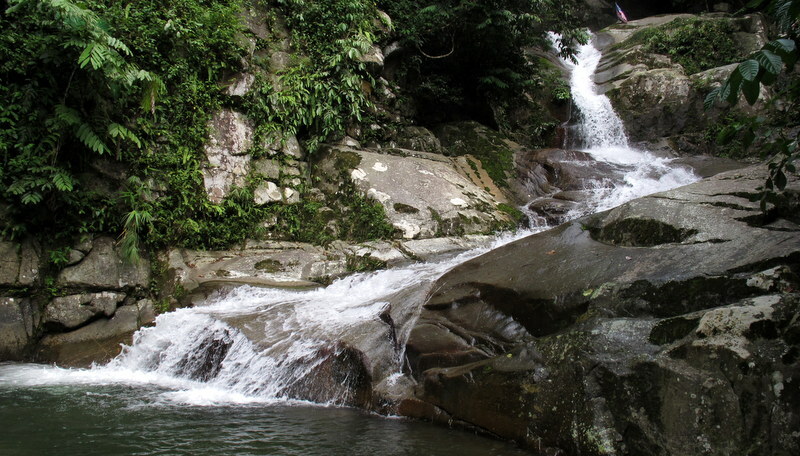 One of my waterfall friends had told me that there was another waterfall, about one hour upstream from the main Lepok fall. He was willing to guide us there. We crossed the river and climbed up on the left side of the fall. It was an interesting hike, partly river trekking. And the upper fall was worth the hike. One year later, the same friend told me that he had discovered a nice waterfall in a tributary of the Lepok river. Of course I was interested to see this fall, so I joined him and his friends in November 2014. Quite a lot of water in the main fall. Access was not that easy, we needed hands and feet ..:-). The tributary waterfall was quite tall but probably only worth visiting when it has been raining a lot. 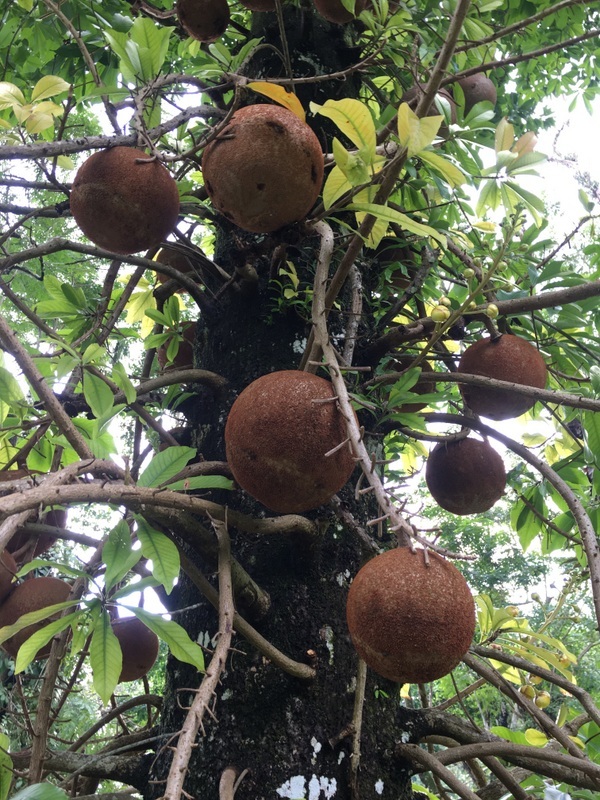 For my fifth visit I joined a Hash Walk to Lepok. A Hash Walk is similar to a Hash Run, there is a paper trail, but it is not competitive and everybody can join. Actually I prefer to hike with only a few people, but since I have developed an allergy for bee stings, I feel it is safer to join a larger group, just in case of emergency. It was quite a big group this time, but because of the paper trail there is no need to hike as a group, everybody can walk at one’s own pace. 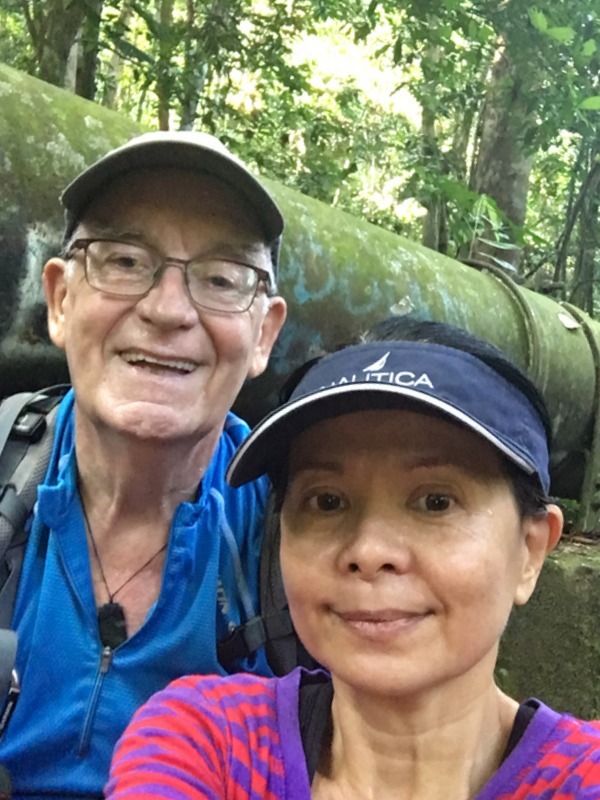 I walked with Suat, my hiking friend. 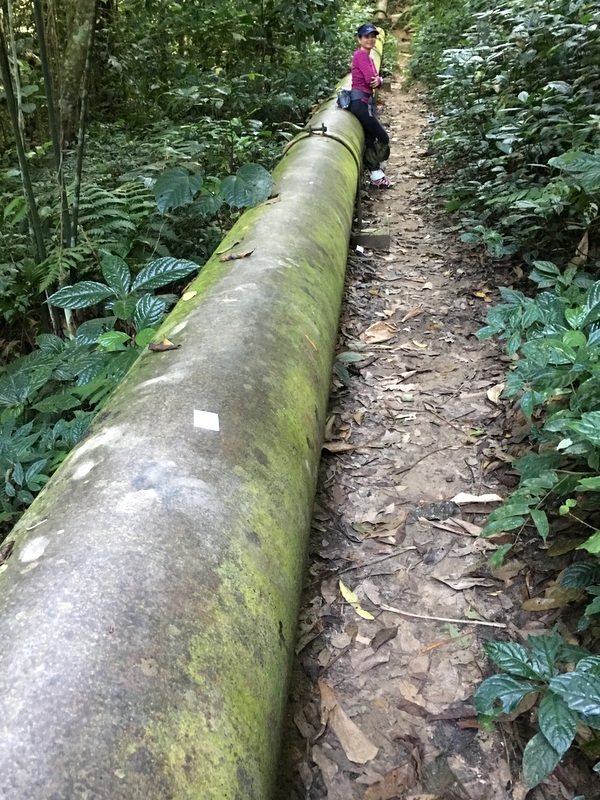 The trail is clear and well-defined, in the first part there are a few forks, but after you have reached the water pipe, you can not go wrong. 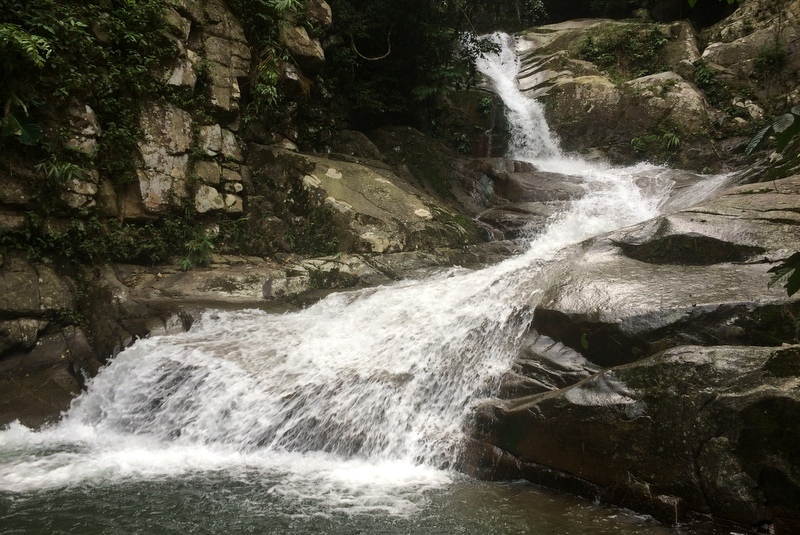 The Lepok waterfall is still nice, but there were swarms of bees, so I felt uncomfortable and went back after a quick bath. After the hike we went to the Langat Seafood and Beer Garden for lunch. Nice food and pleasant company. 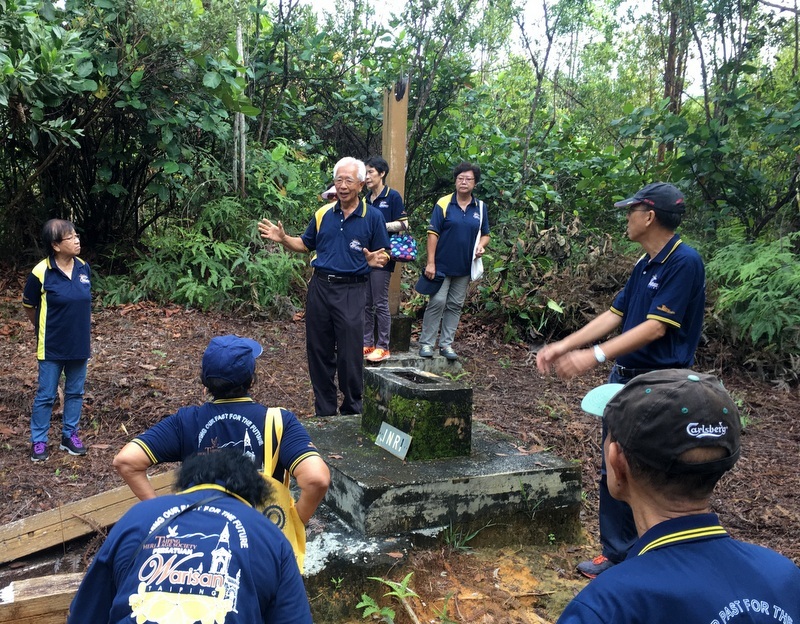 In my last post, Taiping 20-23 May, I reported about my recent Taiping visit. On 23 May Aric joined me with a friend from Hong Kong. We stayed one night in the Flemington hotel in Taiping and then drove back to KL in three days, showing our guest the beauty of Malaysia. 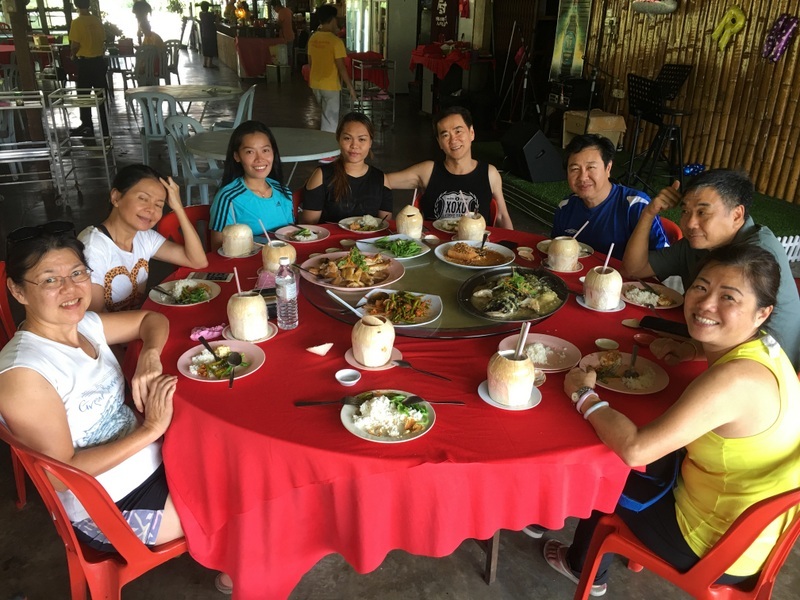 Of course we also enjoyed the Malaysian food, I have collected the food pictures at the end of this post. After their arrival and lunch with assam laksa , we walked in the Lake Gardens. A light afternoon drizzle did not bother us and created a peaceful atmosphere. From our room and of course from the rooftop we had a nice view of the Lake Gardens. To the left an evening view, the right picture was taken in the morning. We went out for dinner to Siang Malam, where we had mamak food. Our friend is a hiker and was interested to visit a waterfall. 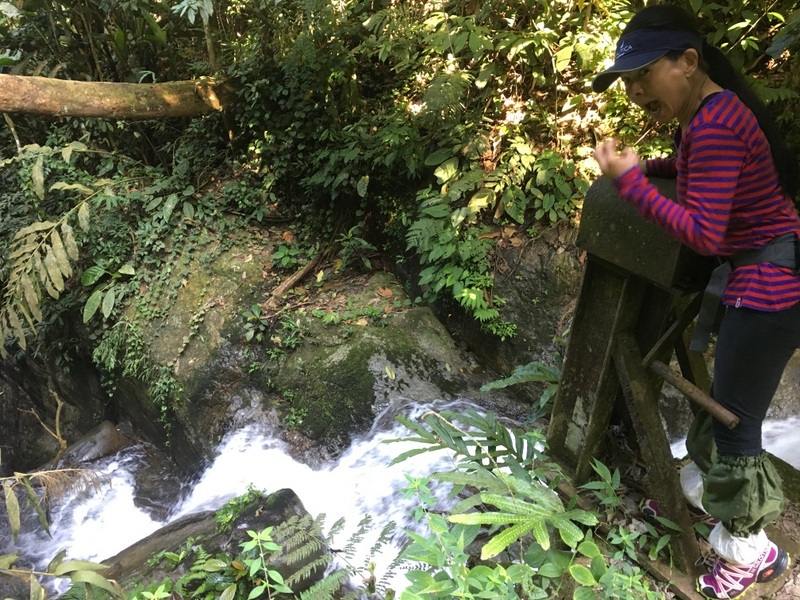 I took him to the Air Hitam waterfall, north of Taiping. An easy hike and a spectacular fall, remote and unspoiled. After lunch in Batu Kurau with roti canai, we started our drive back. 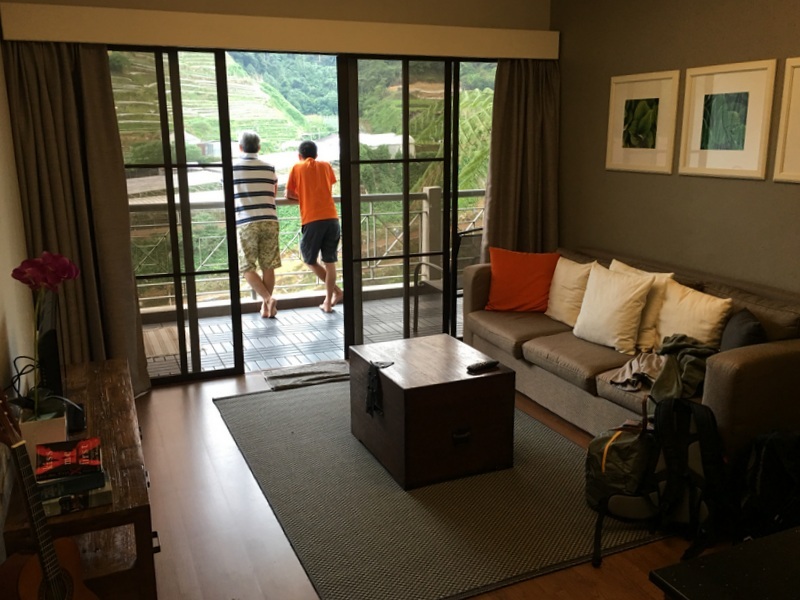 Our destination was Brinchang in the Cameron Highlands, where we had booked an airbnb apartment. The first impression of the CH, when you arrive via the Simpang Pulai road, is quite shocking. 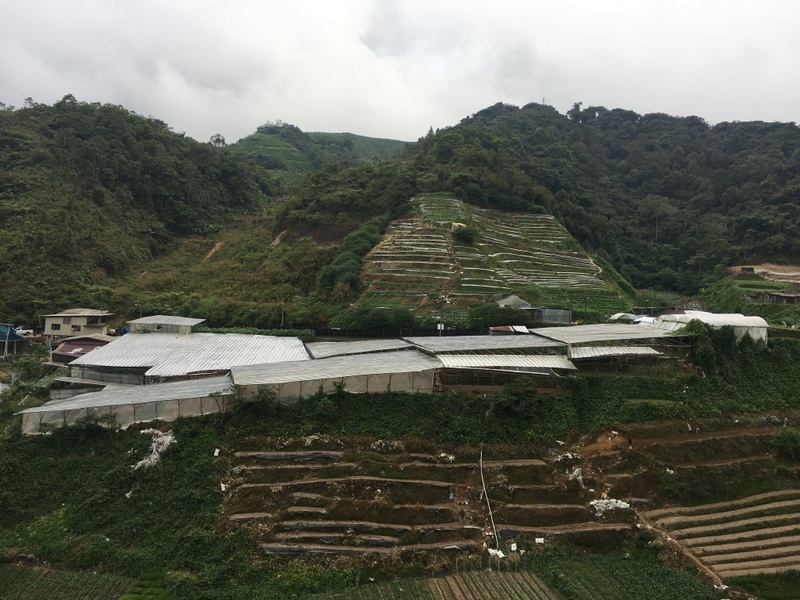 Grey plastic coverings of agricultural farms, as far as the eye can see. Completely spoiled landscape…:-(. Fortunately the view from our apartment was not too bad. 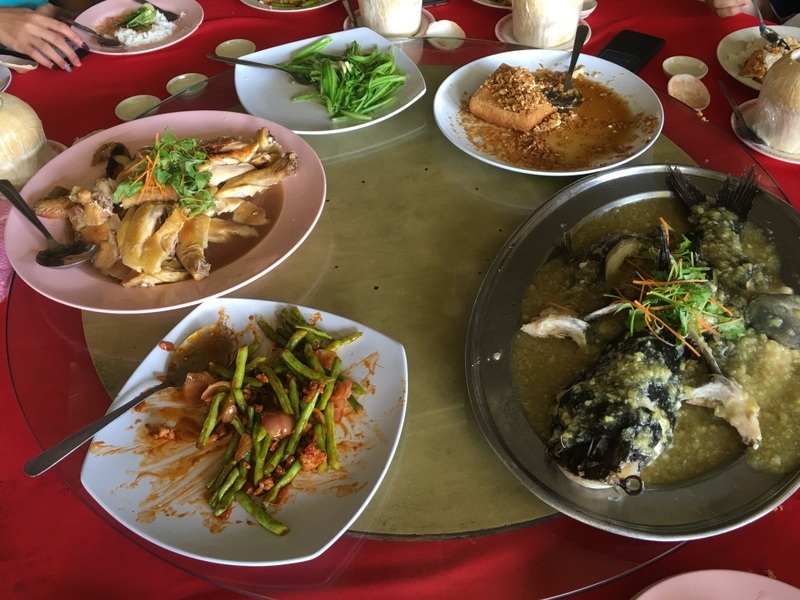 In the CH you must have steamboat, but in Brinchang town the prices are high and the quality low. We went to the Jin Jin restaurant, outside Brinchang and had a delicious steamboat, one of the best I have ever tasted. After our breakfast we had a quick look at two bungalows, the Lutheran Mission Bungalow (left pic), where I have stayed overnight several times in the past, and the Moonlight Cottage (right pic), from where Jim Thompson disappeared in 1967. In 2010 I have written a blog about this fascinating story: What happened to Jim Thompson . The Moonlight cottage is now a guest house and has been renamed Jim Thompson cottage. We took the same (Simpang Pulai) way back, because we wanted to have lunch with freshwater prawns in Tanjung Tualang. 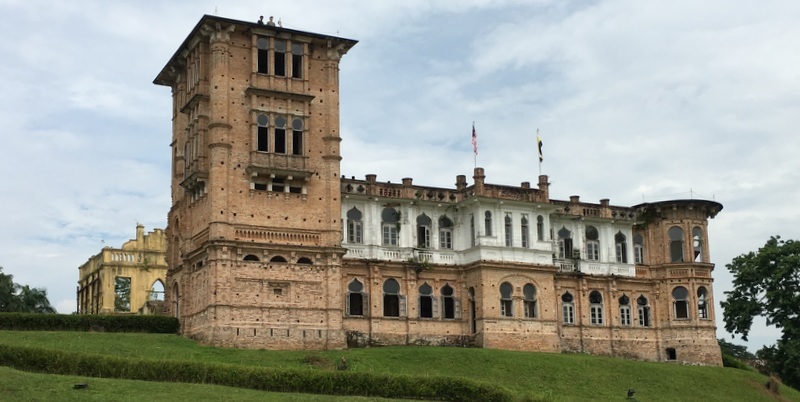 On our way we passed Kellie’s castle. Of course Aric wanted to take an aerial video of this castle. 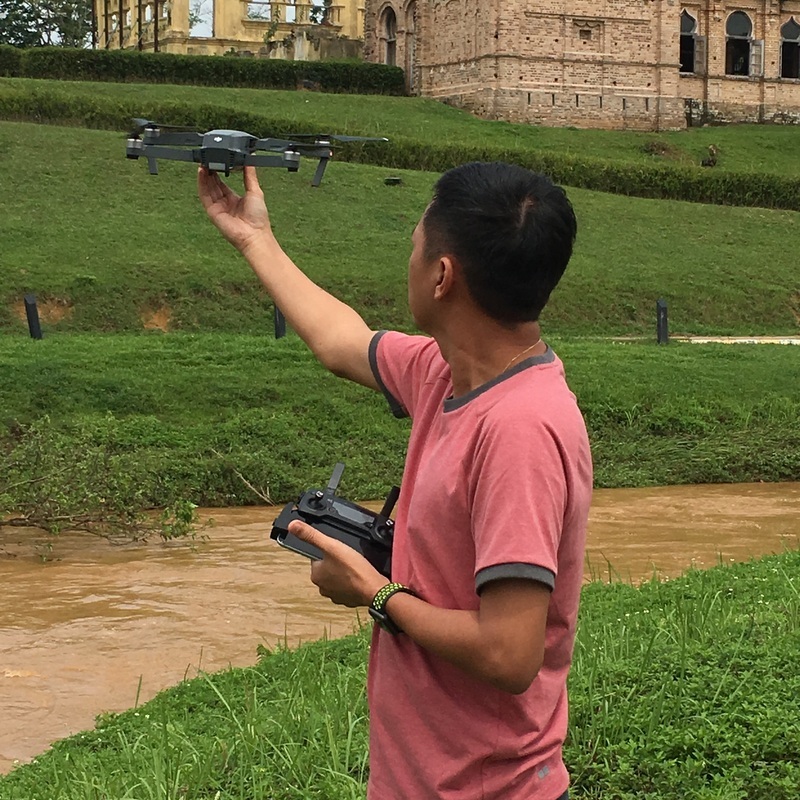 Here you see him preparing the drone and launching it. We continued to another of my favourites, the Tanjung Tualang Tin Dredge. 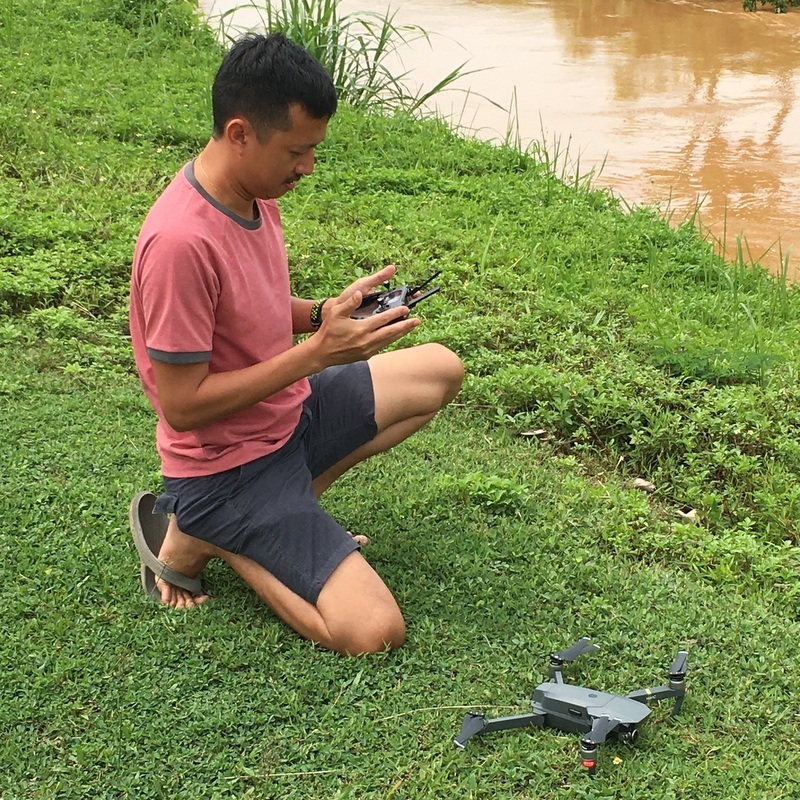 Our guest was impressed and got associations with the Transformer movies…:-) Of course Aric had to take another drone video here. The next day we drove home and our guest to the airport. Here is the drone video. Click on Full Screen and Enjoy! And here is a collection of the food we had. 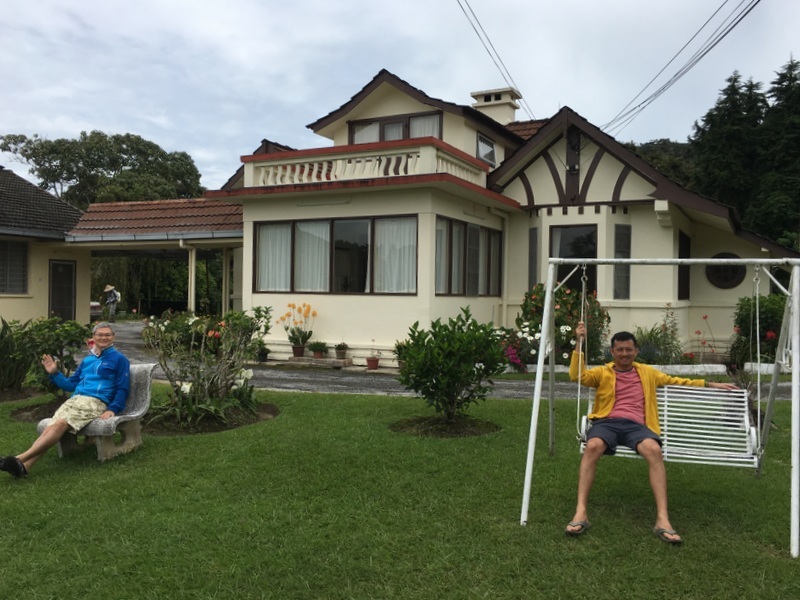 After my visit to Maxwell Hill I stayed a few more days in Taiping. 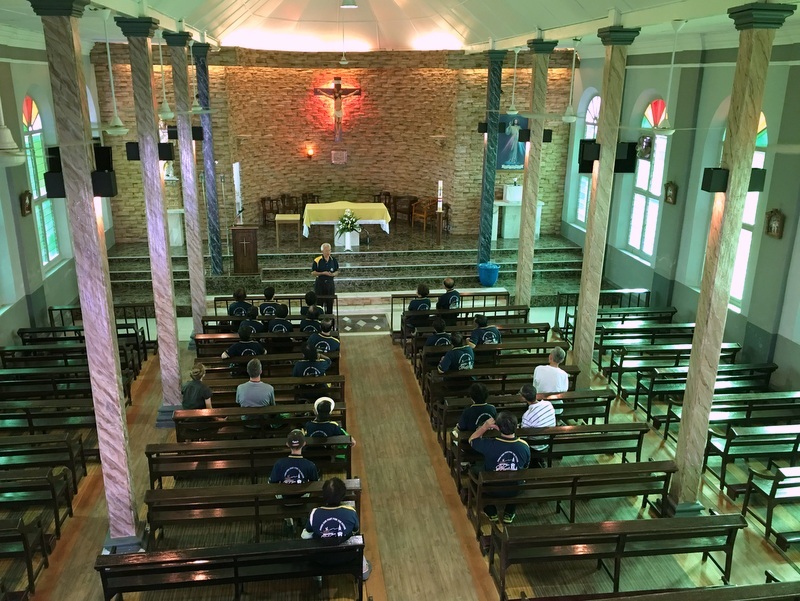 Main reason was to join a THS excursion to the Klian Pau church on Monday 22 May. As I had no car this time, I did a lot of walking. That is no problem in Taiping with its compact town center, where almost everything is within walking distance. In the evening I walked to the Cross Street Bazar , thinking to have some snack food there, but I was a bit too early. The District Office looked beautiful, without the cars parked in front of it during daytime. Walking back along Jalan Kota, I noticed that a crowd of people had assembled, apparently waiting for something to happen. Soon floats appeared, it was a temple procession, similar to the Cingay parade in Johor Baru, although on a smaller scale. In JB it is a famous tourist attraction, here even many of my Taiping friends were not aware of the event. Strange. 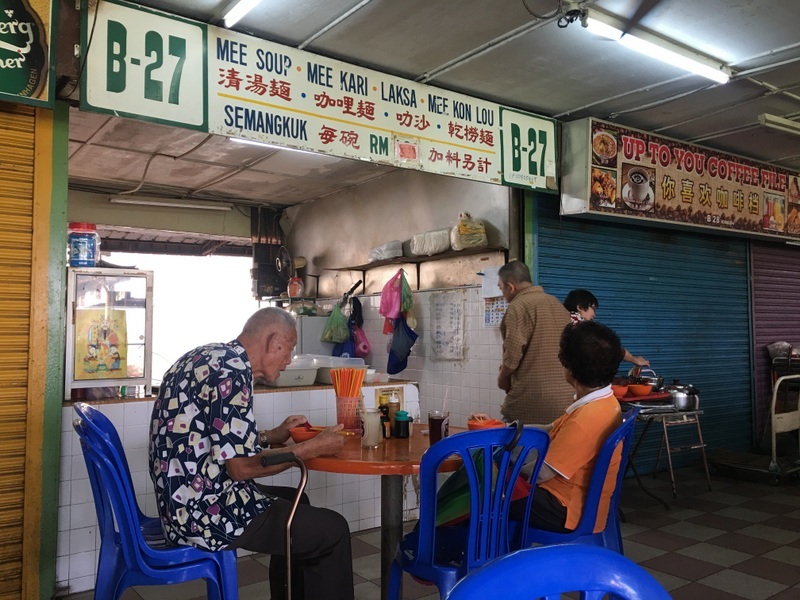 The next morning I went to a hawker center opposite the Taiping Mall for my breakfast. One of the stalls (no 37) is famous for its chee cheong fun, but at 10 am it was already sold out! 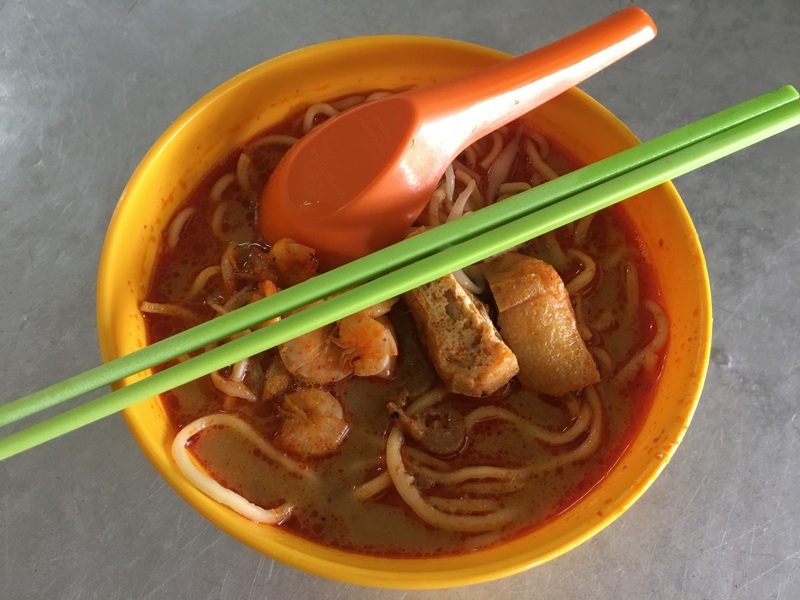 I had curry mee instead with coffee, also not bad and cheap too for only RM 4.60. After my breakfast I started my walk through the town, first looking for mural paintings. The last few years Mural Art has become very trendy in Malaysia. 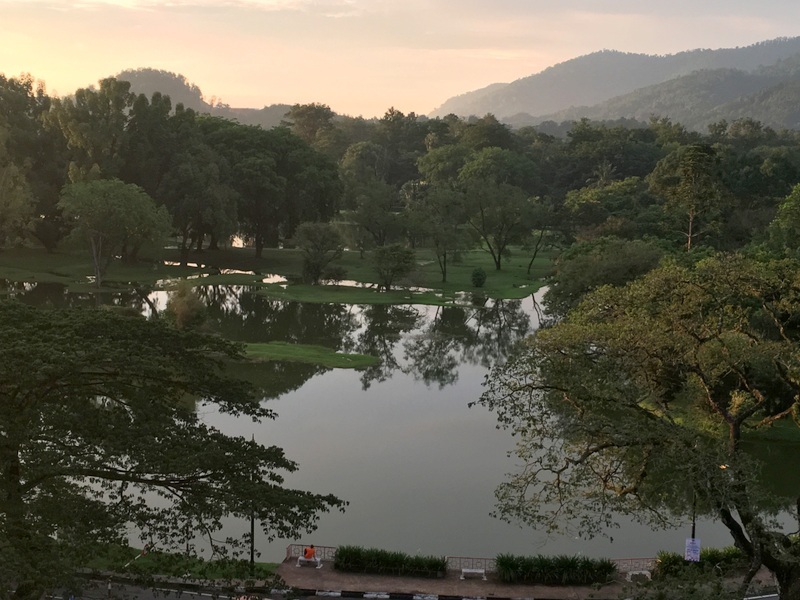 It started in Penang , followed by Ipoh, Kuala Lumpur, Gopeng (he links connect to blogs I have written about it). Of course Taiping did not want to stay behind. Personally I like the Zacharevic style (Penang, Ipoh) best, where often the specific structure of a wall is used to create the mural. In Taiping (like in KL) the walls are used as a huge “canvas”. For example this recent one on a wall of the Kwangtung Association behind the district office. Students of the USM Penang were still working on it during my visit. 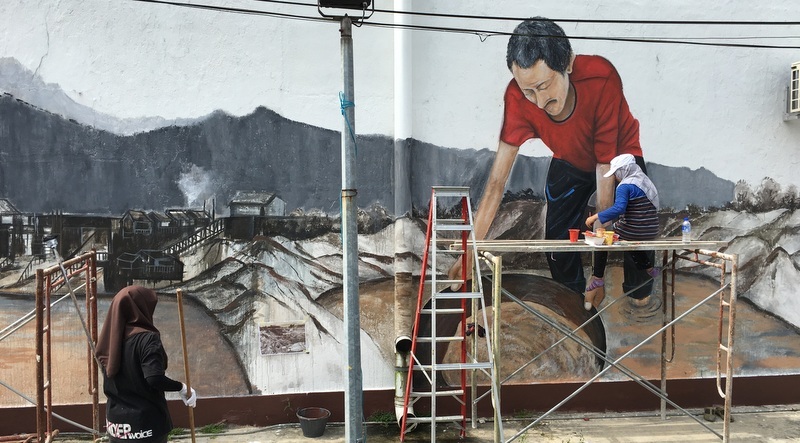 The artworks depict scenes related to Taiping’s past, the tin mining, the first railway, the central market. I have given the approximate location of the murals. Technically well done, but I miss the Zacharevic sense of humor. Jln Lim Teong Chye ? 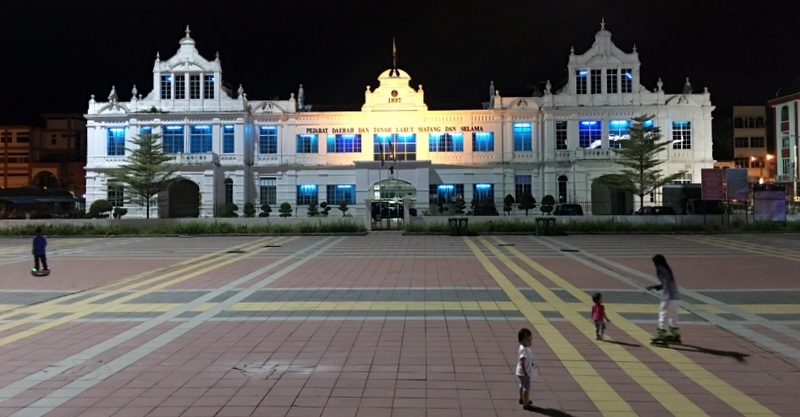 Four years ago I have written a blog “Shame on Taiping” and not much has changed since then. Here a few pictures of the building next to the Rest House. You can enter the building, but AYOR, because squatters live inside. Of course there are also positive things to say. Look for example at this beautiful facade of Ng Boo Bee”s house at,81, Jalan Kota. Ng Boo Bee was a rich Chinese businessman, who rebuilt almost half of Taiping after the disastrous fire of 1880 and this was his residence. Here are a few more pictures of buildings that drew my attention during my walk. 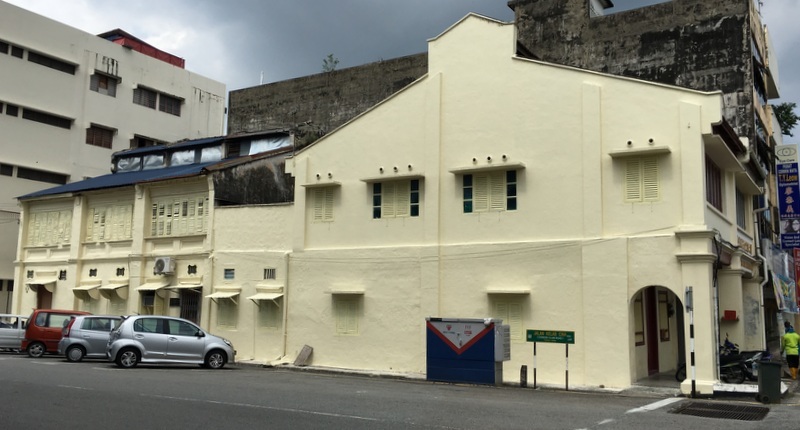 The Peking hotel was built in 1929 as premises for the rubber dealer’s association. It was used by the Japanese Kempeitai during WWII. Now an affordable hotel, the friendly manager allowed me to have a look at the interior. The Peace hotel (1928) also looks good. 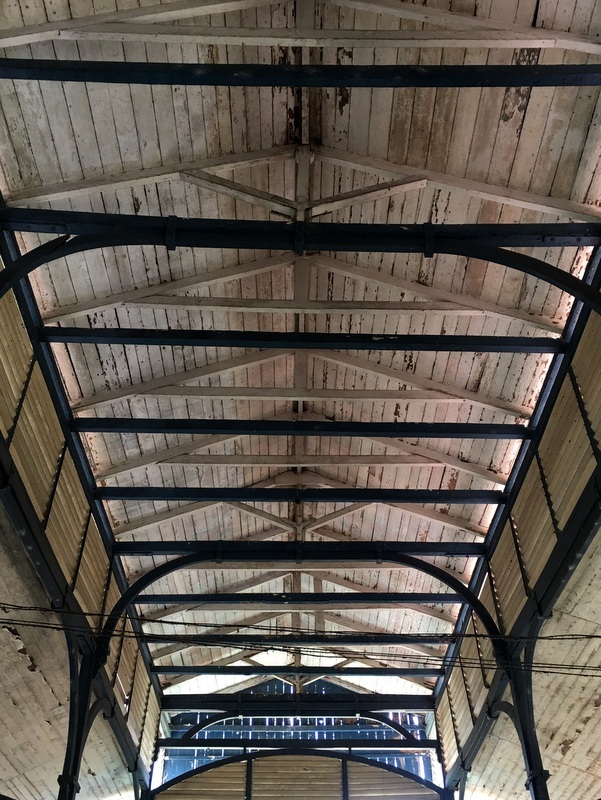 I had a look inside the Central Market, built in 1884/85 and still in use. 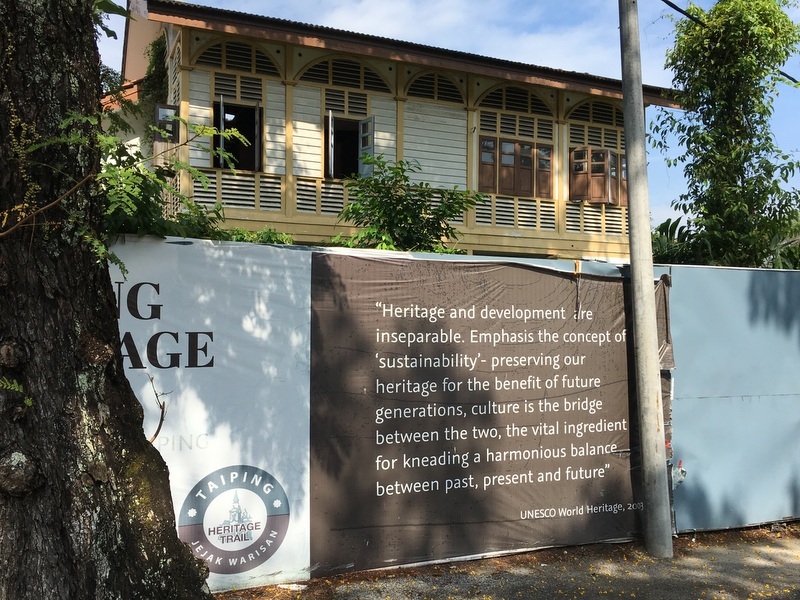 The future of this heritage building is uncertain, there are plans to relocate the Central Market and then renovate the building. 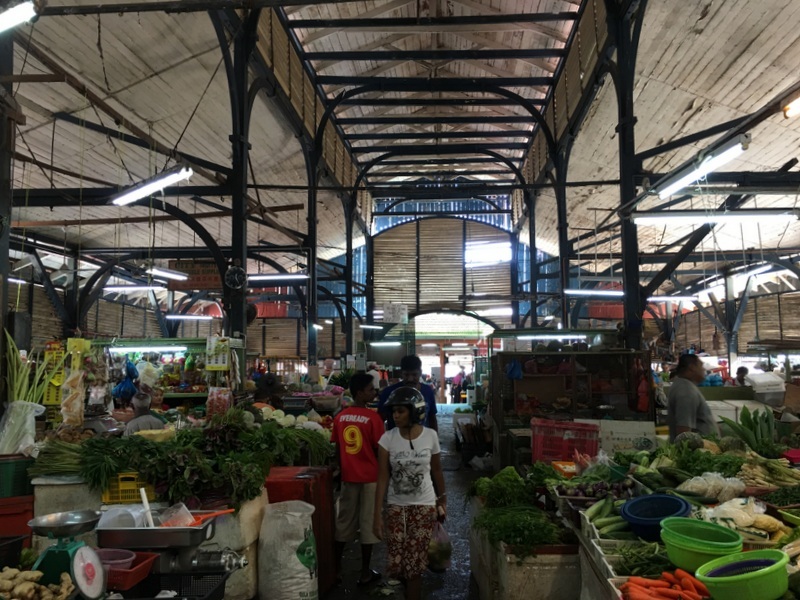 Hopefully it will not become like the Central Market in Kuala Lumpur. 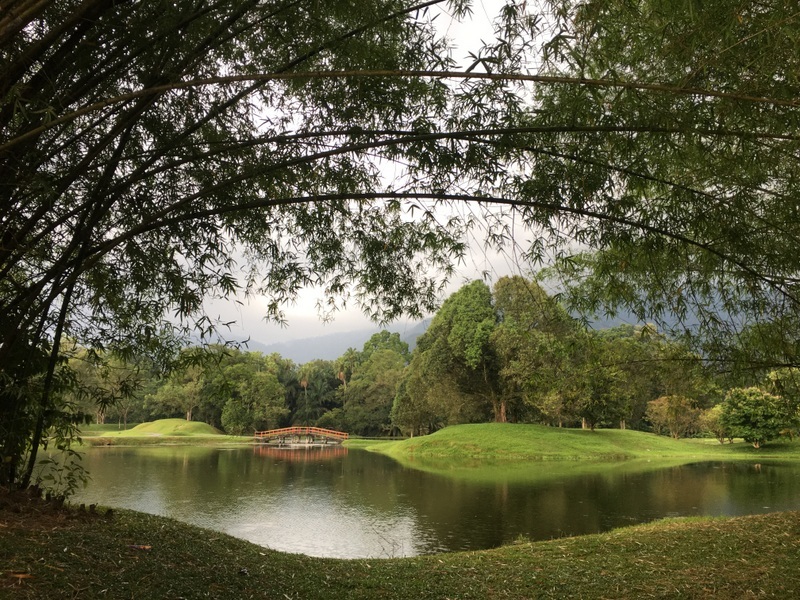 Of course I also spent some time in the Lake Gardens, the most beautiful gardens of Malaysia. 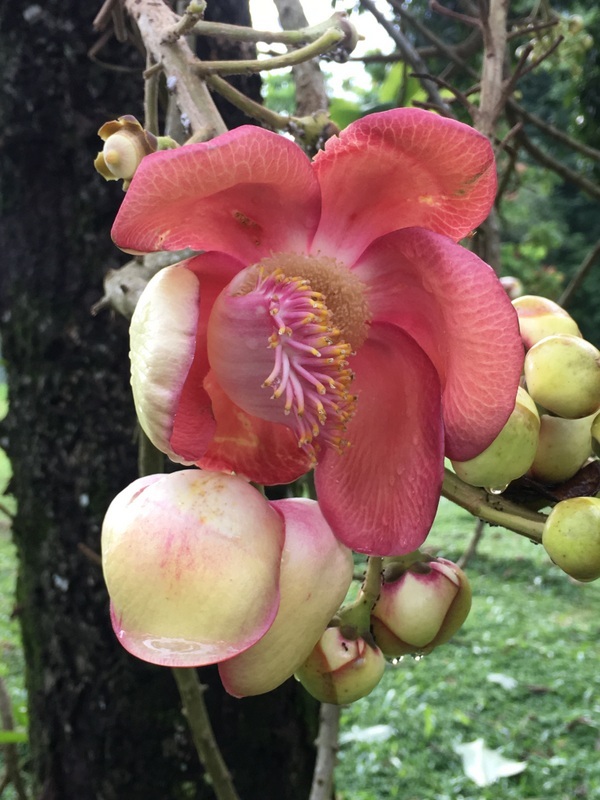 During my many visits to Taiping I must have taken hundreds of pictures, it never gets boring. That evening Yeap, the president of THS had invited me for a concert by a Polish accordion player, in the hall of St George’s Institution. It was an interesting performance of classical pieces, arranged for accordion by Waclav Turek himself. I was very impressed by one of the first pieces he played, Bach’s toccata and fugue in d minor. I recorded a small part of this masterwork, originally written for organ. The next morning, Yeap picked me up from my hotel for the THS event. The Klian Pau church is the oldest Catholic church in Taiping. Built in 1875 as a simple wooden structure on top of a hill, it was replaced by a stone building at the foot of the same hill in 1884. 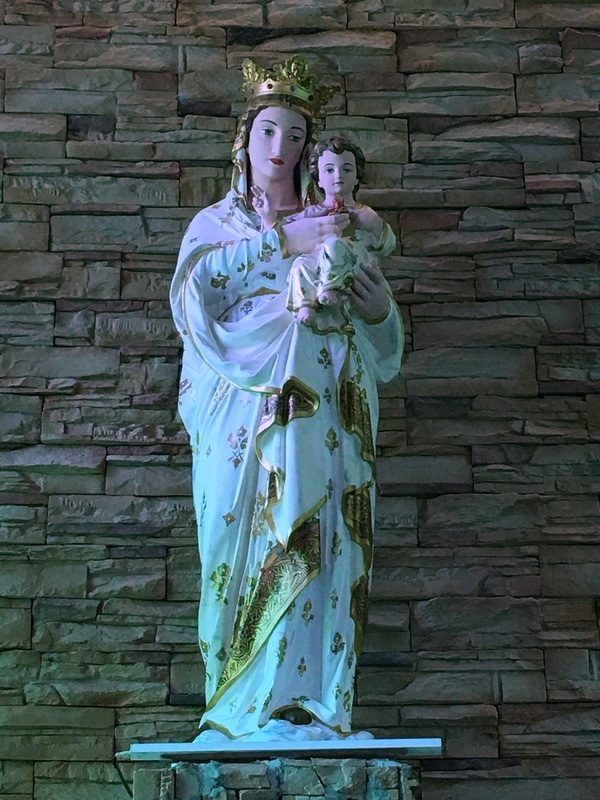 The official name is Our Lady of the Sacred Heart church. THS member Rocky explained the history of the church and showed us around. The hill behind the church is called Calvary Hill. Read more about the interesting story of this hill here. 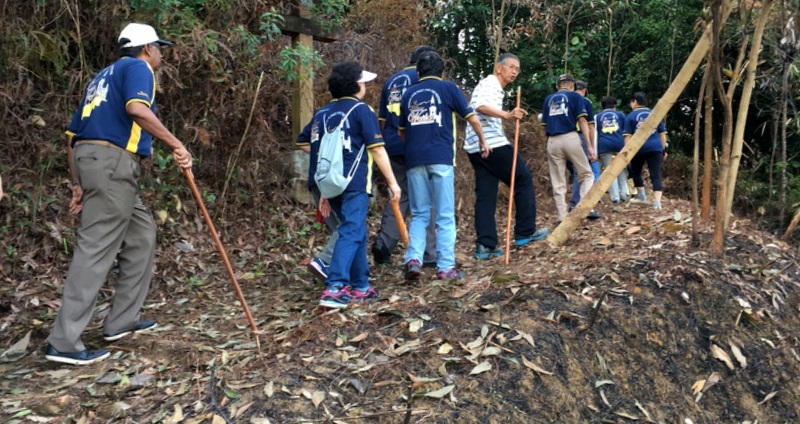 It was completely overgrown and in preparation for this trip, Yeap and his workers had done a good job to clear the path up the hill. 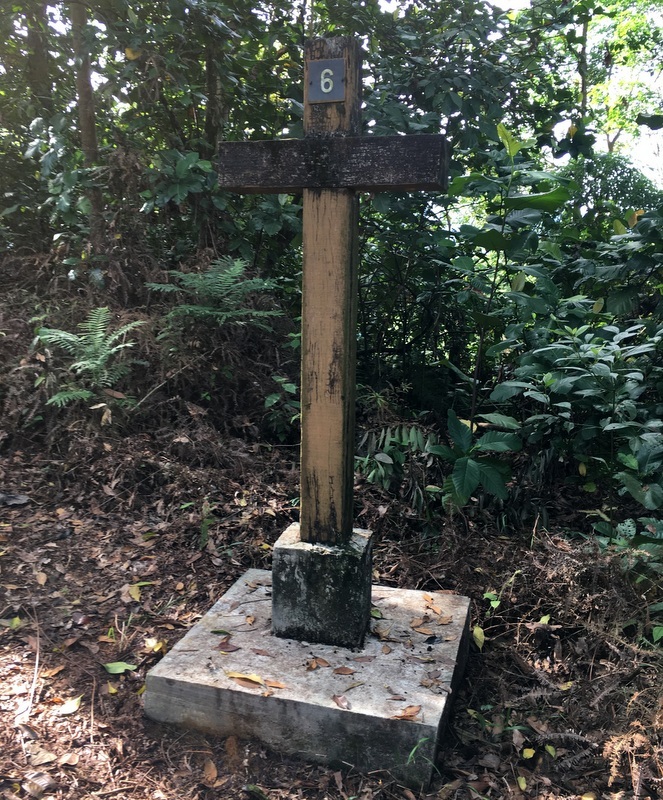 On our way up, we passed several Stations of the Cross. In the past there may have been a view of Taiping from the top of the hill, but now it was blocked by trees. We also had a look at the nearby cemetery. On the slope of a hill, very Chinese (Feng Shui). Old and new graves next to each other. I was wondering if it was possible to get more information about the old grave of J. Mc.Namara, who died 18 June 1894. Surprisingly I found a reference in The Chronicle and Directory of China Etc. 1892 ! He was an Inspector Second Class in the First Battalion, Perak Sikhs, stationed at Batang Padang. His commander? R.S.F Walker, whose statue can be found at the Perak Museum. After my breakfast I decided to try the Heritage Bus, a new initiative. According to my map, there should be a bus stop opposite the Taiping Mall. Asking around, nobody knew about it, they directed me to the starting point, near the Peace Hotel. There I found a shabby waiting area and an ultra-modern bus. I paid one Ringgit and entered the bus, with a few more locals. After about half an hour we were back, we had done the Heritage Trail, without any information or explanation. Completely useless, but nice air-con in the bus. Simple changes could make it a lot better. 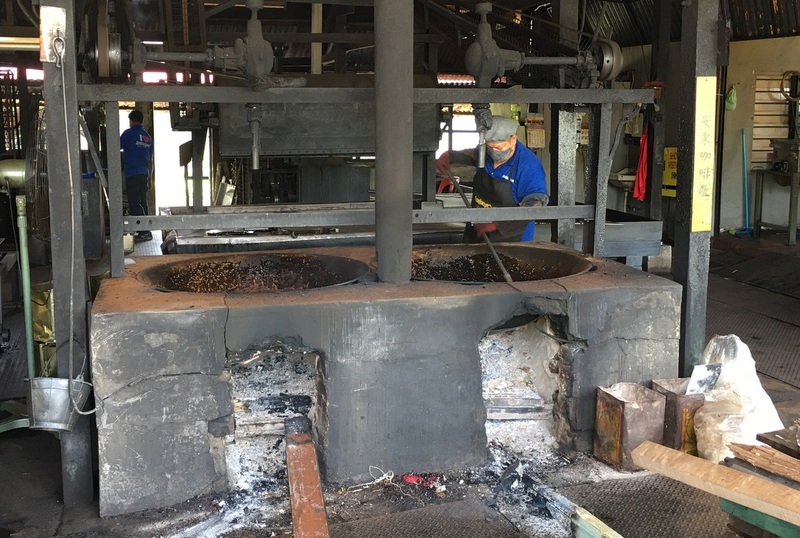 In the afternoon, with friends who had arrived from KL, I visited the Antong coffee mill. 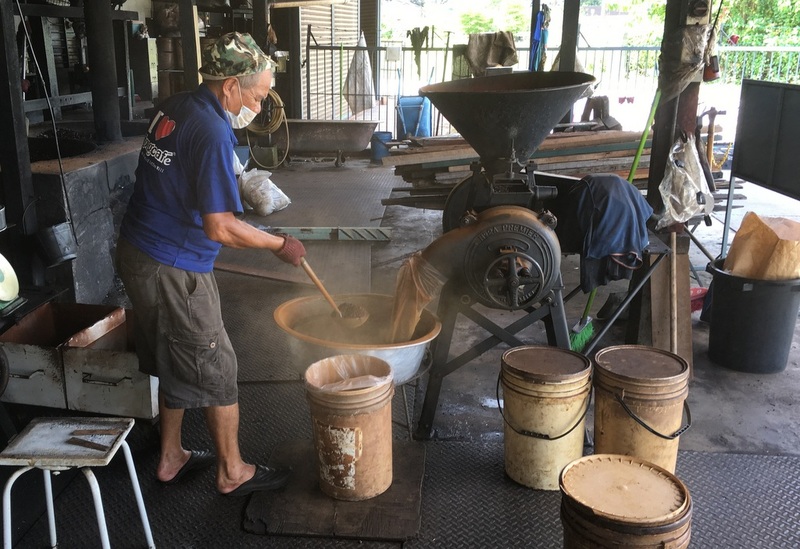 We had a look at the mill, where they were roasting the coffee, and tasted a few varieties of coffee. 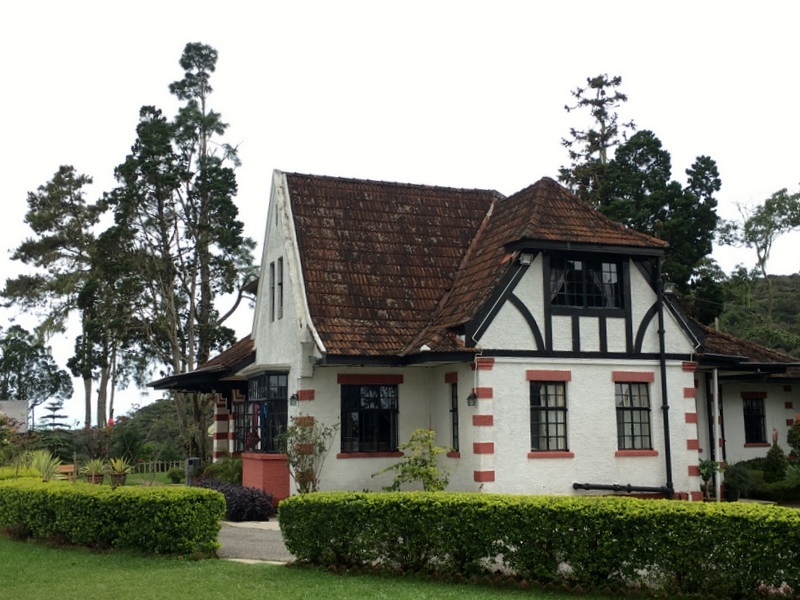 Located on the Antong grounds is a nice house, where in the beginning of the 20th century Sun Yat Sen’s mistress has been living. 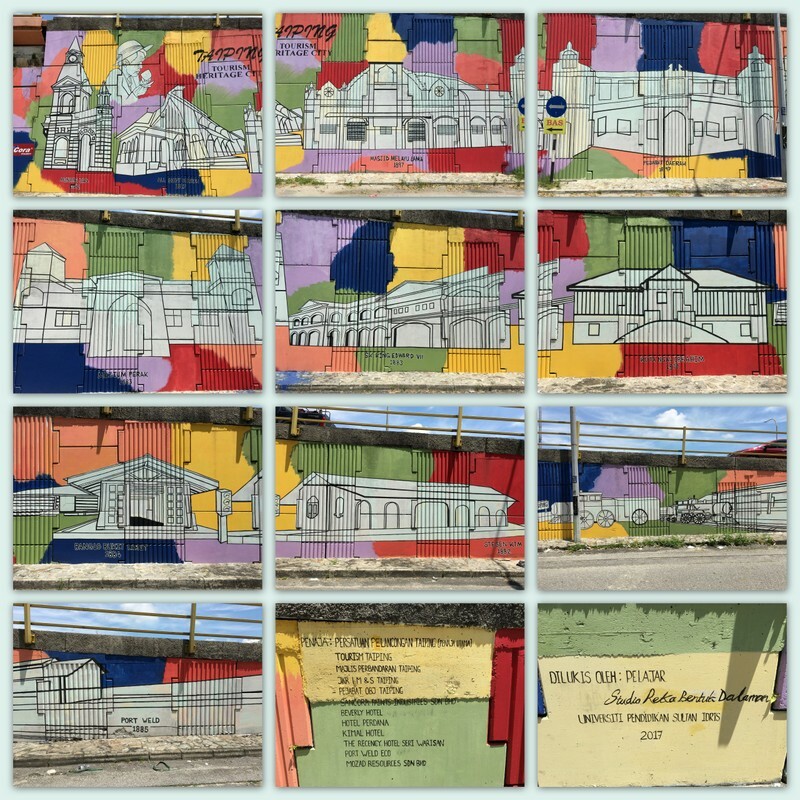 I had visited the Coffee mill and the Sun Yat Sen house earlier, but I was interested to see a recent mural near the factory. 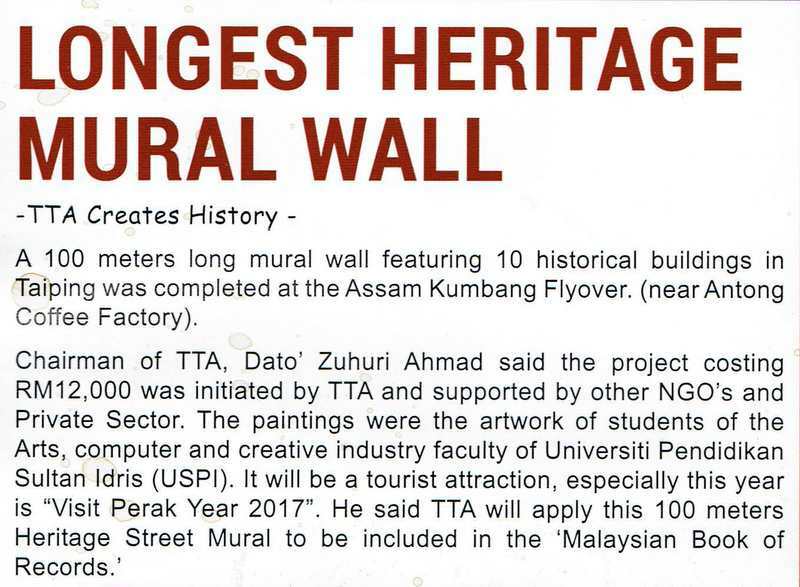 Again large-scale, 100 meter long, maybe it will be included in the Malaysian Book of Records as the Longest Heritage Street Mural. 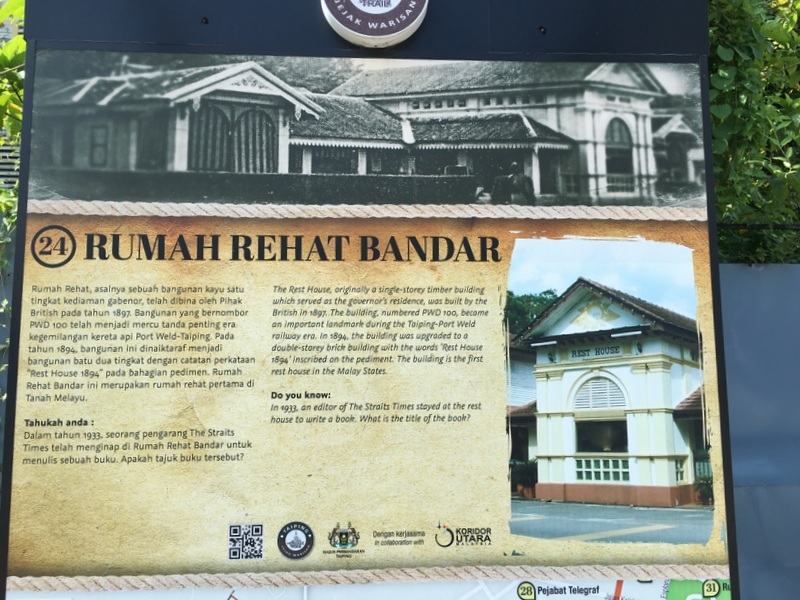 But will it become a tourist attraction, as suggested by the TTA (Taiping Tourist Association)? I have my doubts. 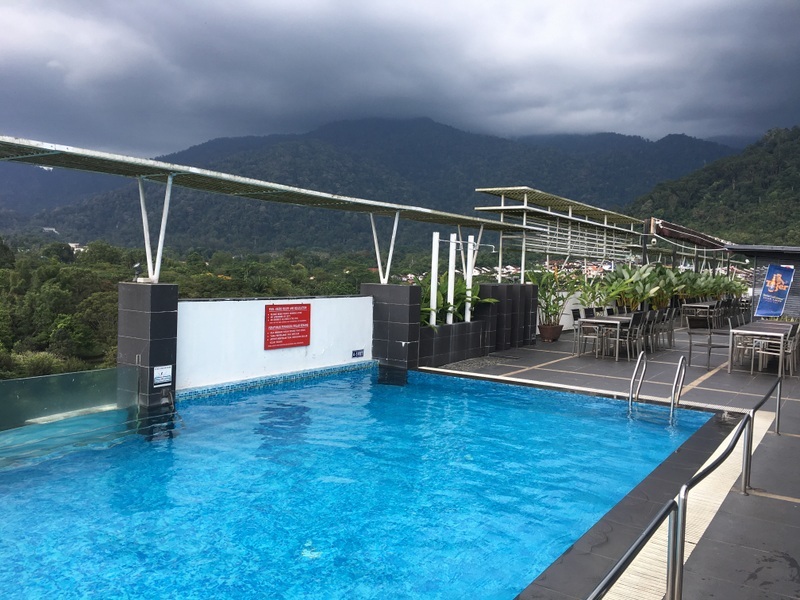 The last night in Taiping we stayed in Flemington, where we enjoyed the rooftop swimming pool and the nice view of the Lake Gardens.